Scientists in the United States led by a Chinese geologist have made a discovery that could help explain why the Tibetan plateau is a centre for seismic activity and assist in predicting future tremors. 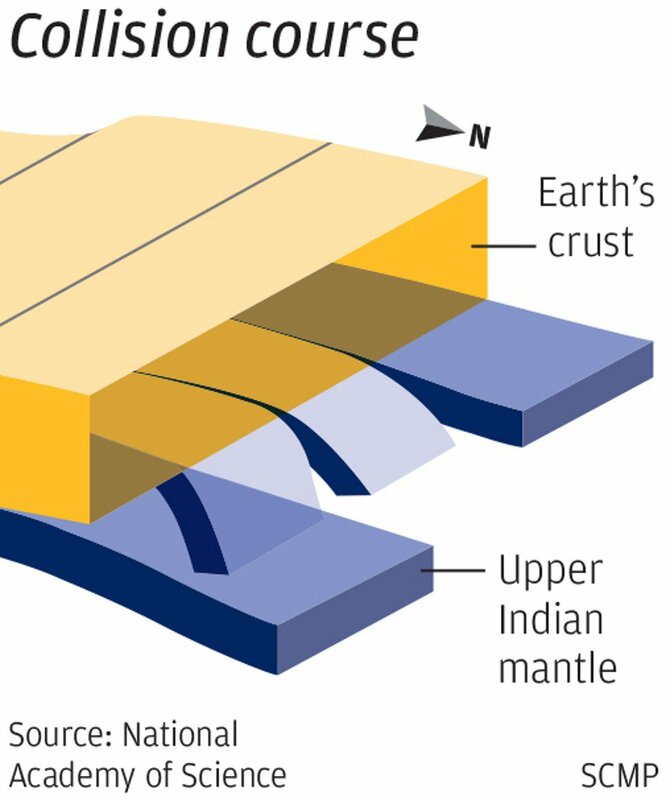 According to Song Xiaodong, who headed the study at the University of Illinois, the upper mantle layer of the Indian tectonic plate was torn into four pieces when it collided with the Eurasian Plate tens of millions of years ago. “The collision between the Indian and Asian tectonic plates produced some of the deadliest earthquakes in the world,” said Song in the study published on Tuesday in the American edition of the Proceedings of the National Academy of Sciences. Song is also a researcher at Wuhan University in central China. “However, the vast plateau is largely inaccessible to geological studies due to poor transport and bad weather,” he said. The discovery would help geologists to understand what role the Indian upper mantle played in shaping the ever-growing Tibetan plateau and help them to better assess future earthquake risks, Song said. Before the new findings, geologists were aware of the existence of the tears but did not know how many there were or what shape they were, he said. The Tibetan plateau – the largest and highest in the world – and Himalayan mountain range were created when India slammed into Asia. Although the initial impact was 50 million years ago, the collision continues deep underground to this day. Over the past century, more than a dozen earthquakes with a magnitude or more than 7.5 have been recorded on the southern Tibetan plateau, Song said. In April 2015, almost 9,000 people were killed and 22,000 were injured when a magnitude 7.9 quake hit Nepal. The biggest tremor in the region (caused by continental collision rather than subduction – the term used when one plate slides under another) was the Assam-Tibet quake that struck in 1950, which measured 8.5 on the Richter scale and left about 4,800 people dead. Its epicentre was south of McMahon Line in a area disputed by China and India. In 2008, a magnitude 8 earthquake in southwest China’s Sichuan province (also caused by continental collision) left 87,000 people dead, 370,000 injured and 5 million homeless. Song said his team generated tomographic images of Tibet extending about 160km (100 miles) underground by collecting seismic wave data from various sources. The new images matched well with historic earthquake activity and geological observations, he said. “The three tears formed by the four pieces help explain why mantle-deep earthquakes occur in some parts of southern Tibet and not others,” he said, as deeper earthquakes were more likely to happen on the four “fingers” and not in the gaps. The findings would shed more light on continental collisions, which happened in more places than subduction, Song said. “The discovery can be applied to research on the Tethyan Tectonic domain, which ranges from China to the Alps, including [China’s] Sichuan province, the Tibetan plateau, Iran and Turkey,” he said. Subduction can cause large earthquakes and tsunami as seawater is disrupted by the moving sea floor. The magnitude 9 earthquake in Japan in 2011 that caused a tsunami happened when the Pacific Plate subducted under the plate beneath northern Honshu in Japan, Song said.